Flattening the Wood for the Back: I clamp the back between a bench dog and my vise dog, and use cello posts underneath to prevent it from rocking. Most of the planing is done across the piece, not with the grain; it's faster, and leaves less of a mess. This piece is already flattened, and scraped smooth. Aligning for Outlining: When the outline is traced from the ribs, it's very important to ensure that nothing moves! Tracing the Outline: A pen inside a washer marks the outline of the plates 2.3mm from the outside of the ribs, all around. Finishing the Drawing of the Outline: The washer helps trace around the corners, but the exact shape of the corners must be drawn in. 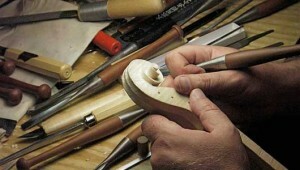 I do it only roughly, allowing room for adjusting everything by eye in the final shaping. It's one thing to just follow a line, another to make things look like they should, so in the end, I'll do what looks best, not what the lines indicate. Sawing the Outline: I don't use too many power tools, but the band saw is very handy for this step. I stay outside the line I've drawn; the outline will be finished carefully with files later. Notice the safety glasses—I put them in the picture as a reminder. Anytime there's a risk, I'm sure to be wearing them! Marking Preliminary Edge Thickness: Usually I work in stages, homing in gradually on what I want. For example, I set the initial edge thickness using a purfling cutter (a knife with a guide to keep it at a set distance from an edge). Initially I make the edge a bit too thick to guard against mishaps when gouging the arch, and will re-mark it later, when I'm ready to finish the edge to its final thickness. Gouging to the Mark: Relatively quickly I gouge down to the mark I made, and then work more on the arch. Starting the Arch: Without too much thought, initially I just remove a lot of the wood that's between me and the finished back. Developing the Arch: Under all that wood, there's a viola back! After the gouging, I move to a large finger plane to smooth out the gouge marks and start revealing the arch I want. At this point I'm thinking about the final shape of the arch, but there's still a long way to go. Initial Shaping Completed: Now I have the outlines roughly sawn and the arches roughly shaped. It's time to move toward something more precise. The next thing I'll do is file the outlines precisely to their final shapes so I can finish the edge thicknesses, inlay the purfling, and get serious about finishing the arches.